Franz Joseph Haydn (31 March 1732 – 31 May 1809), known as Joseph Haydn (German pronunciation: [ˈjoːzɛf ˈhaɪdən]; English: /ˈdʒoʊzəf ˈhaɪdən/), was an Austrian composer, one of the most prolific and prominent composers of the Classical period. He is often called the "Father of the Symphony" and "Father of the String Quartet" because of his important contributions to these forms. He was also instrumental in the development of the piano trio and in the evolution of sonata form. Joseph Haydn was born in Rohrau, Austria, a village near the border with Hungary. His father was Mathias Haydn, a wheelwright who also served as "Marktrichter", an office akin to village mayor. Haydn's mother Maria, née Koller, had previously worked as a cook in the palace of Count Harrach, the presiding aristocrat of Rohrau. Neither parent could read music; however, Mathias was an enthusiastic folk musician, who during the journeyman period of his career had taught himself to play the harp. According to Haydn's later reminiscences, his childhood family was extremely musical, and frequently sang together and with their neighbors. During this arduous time, Haydn worked at many different jobs: as a music teacher, as a street serenader, and eventually, in 1752, as valet–accompanist for the Italian composer Nicola Porpora, from whom he later said he learned "the true fundamentals of composition". He also was briefly in Count Friedrich Wilhelm von Haugwitz's employ, playing the organ in the Bohemian Chancellery chapel at the Judenplatz. 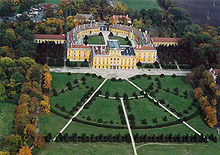 As a "house officer" in the Esterházy establishment, Haydn wore livery and followed the family as they moved among their various palaces, most importantly the family's ancestral seat Schloss Esterházy in Eisenstadt and later on Eszterháza, a grand new palace built in rural Hungary in the 1760s. Haydn had a huge range of responsibilities, including composition, running the orchestra, playing chamber music for and with his patrons, and eventually the mounting of operatic productions. Despite this backbreaking workload, the job was in artistic terms a superb opportunity for Haydn. The Esterházy princes (first Paul Anton, then most importantly Nikolaus I) were musical connoisseurs who appreciated his work and gave him daily access to his own small orchestra. 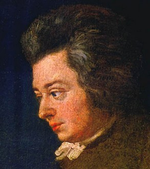 Another friend in Vienna was Wolfgang Amadeus Mozart, whom Haydn had met sometime around 1784. According to later testimony by Michael Kelly and others, the two composers occasionally played in string quartets together. Haydn was hugely impressed with Mozart's work and praised it unstintingly to others. Mozart evidently returned the esteem, as seen in his dedication of a set of six quartets, now called the "Haydn" quartets, to his friend. For further details see Haydn and Mozart. Musically, the visits to England generated some of Haydn's best-known work, including the Surprise, Military, Drumroll, and London symphonies, the Rider quartet, and the "Gypsy Rondo" piano trio. The only misstep in the venture was an opera, L'anima del filosofo, which Haydn was contracted to compose, but whose performance was blocked by intrigues. Haydn made many new friends and was involved for a time in a romantic relationship with Rebecca Schroeter. 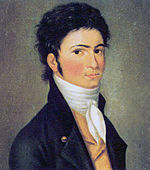 While traveling to London in 1790, Haydn had met the young Ludwig van Beethoven in his native city of Bonn. On Haydn's return, Beethoven came to Vienna and during the time up to the second London visit was Haydn's pupil. For discussion of their relationship, see Beethoven and his contemporaries. Haydn returned to Vienna in 1795, moved into a large house in the suburb of Gumpendorf, and turned to the composition of large religious works for chorus and orchestra. These include his two great oratorios (The Creation and The Seasons) and six masses for the Eszterházy family, which by this time was once again headed by a musically inclined prince. 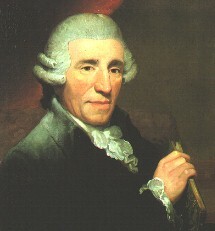 Haydn also composed instrumental music: the popular Trumpet Concerto and the last nine in his long series of string quartets, including the Fifths, Emperor, and Sunrise quartets. 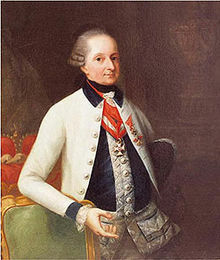 Haydn died at the end of May in 1809, shortly after an attack on Vienna by the French army under Napoleon. He was 77. Among his last words was his attempt to calm and reassure his servants when cannon shot fell in the neighborhood. "My children, have no fear, for where Haydn is, no harm can fall." 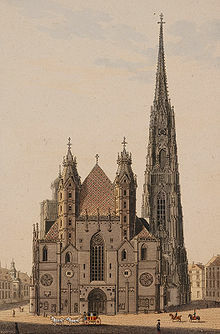 Two weeks later, a memorial service was held in the Schottenkirche on 15 June 1809, at which Mozart's Requiem was performed. Haydn's signature on a musical work. He writes in Italian, a language he often used professionally: di me giuseppe Haydn, "by me Joseph Haydn". In the late 1760s and early 1770s Haydn entered a stylistic period known as "Sturm und Drang" (storm and stress). This term is taken from a literary movement of about the same time, though it appears that the musical development actually preceded the literary one by a few years. The musical language of this period is similar to what went before, but it is deployed in work that is more intensely expressive, especially in the works in minor keys. James Webster describes the works of this period as "longer, more passionate, and more daring." Some of the most famous compositions of this time are the "Trauer" (Mourning) Symphony No. 44, "Farewell" Symphony No. 45, the piano sonata in C minor (Hob. XVI/20, L. 33), and the six string quartets of Op. 20 (the "Sun" quartets), all from ca. 1771-1772. 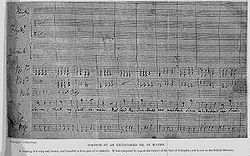 It was also around this time that Haydn became interested in writing fugues in the Baroque style, and three of the Op. 20 quartets end with such fugues. ^ The date is uncertain. 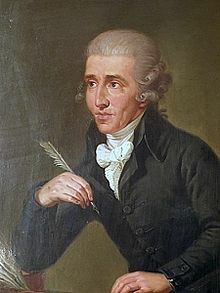 Haydn himself told others he was born on this day (Geiringer (1982, 9); Griesinger (1810, 8)), but some of his family members reported April 1 instead (Geiringer). The difficulty arises from the fact that in Haydn's day official records recorded not the birth date but rather the date of baptism, which in Haydn's case was 1 April (Wyn Jones 2009, 2-3). ^ Rita Steblin, 'Haydns Orgeldienste "in der damaligen Gräfl. Haugwitzischen Kapelle"', in: Wiener Geschichtsblätter 65/2000, p. 124-34. ^ According to Jones, the London visits yielded a net profit of 15,000 florins. Haydn continued to prosper after the visits and at his death left an estate valued at 55,713 florins. These were substantial sums; for comparison, the house he bought in Gumpendorf in 1793 (and then remodeled) cost only 1370 florins (all figures from Jones 2009:144-146). ^ The premier performance occurred only in 1951, at the Florence May Festival with Maria Callas in the role of Euridice. The opera and its history are discussed in Geiringer 1982, pp. 342–343. ^ Diagnosis was uncertain in Haydn's day, so the precise illness is unlikely ever to be identified. Haydn's symptoms were weakness, dizziness, inability to concentrate, and painfully swollen legs (Jones 2009a:146). Jones (2009b:216) suggests that Haydn suffered from arteriosclerosis. Jones, David Wyn (2009a) The Life of Haydn. Oxford University Press. Focuses on biography rather than musical works; a up-to-date study benefiting from recent scholarly research on Haydn's life and times. Sutcliffe, W. Dean (1989). "Haydn's Musical Personality". The Musical Times 130 (1756): 341–344. doi:10.2307/966030. http://jstor.org/stable/966030. This page was last modified on 25 February 2011 at 18:34.